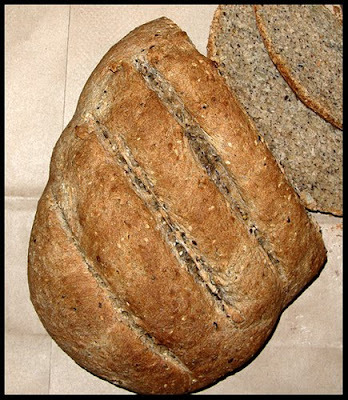 This is another recipe from Peter Reinhart's Whole Grain Bread book. The technique is similar to the pizza crust recipe a couple posts down. If you want to try some of these whole grain recipes I really suggest getting the book since it's just chock full of information. If you really, really want the bread recipe, e-mail me and I'll send it to you. Anyway, the bread was amazing! The seeds I used were: poppy, hemp, chia, sesame, and sunflower. For the flours I used 50% whole wheat, and then about 25% barley flour and 25% white flour. I love how all the seeds give this bread such a nutty taste. And the whole grain flours make it very hearty. This bread makes the best toast I've ever had. 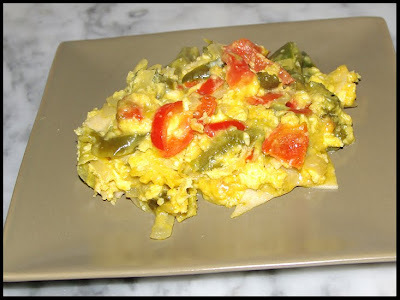 I served the bread for breakfast with Mexican Scrambled Eggs. This has so much more flavor than just plain scrambled eggs. It's full of chilies, onions, tomatoes, and corn tortillas. Your tongue will do a happy dance when you take your first bite. You could also add some cheese and bell peppers as I did. I hope you're able to have an equally delicious breakfast this weekend. The bread looks great! What a great breakfast with the eggs. I just took a look and that book is available through my library, so I may need to get it and give it a test run. Whoa! Doesnt this bread look just fabulous! My eyes are doing a happy dance, Michelle. That bread looks too good to be true. I love seeded, wheaty breads. You are some baker!